Whether you are trying to get in the game faster or store all your precious memories, the Crucial P1 SSD delivers. Capacities start at 500GB and scale to 1TB. With sequential read/write speeds up to 2,000/1,700 MB/s, 5 the P1 provides unwavering performance via hybrid-dynamic write acceleration, a unique SLC cache implementation. The drive offers an MTTF of 1.8 million hours and an endurance of up to 200TB total bytes written, with power usage at an active average of 100mW. 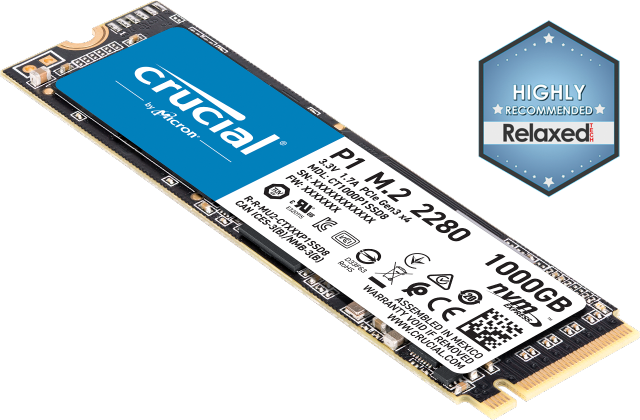 The Crucial P1 SSD leverages the NVMe PCIe interface and Micron’s leading-edge QLC technology to deliver fast capacity for less. 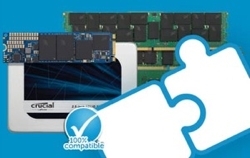 With thousands of hours of Micron pre-release validation, dozens of SSD qualification tests, and a heritage of award-winning SSDs, the Crucial P1 has been thoroughly tried, tested, and proven. NVMe™ PCIe® technology delivers sequential read/write speeds up to 2,000/1,700 MB/s so you can hammer out your work and compete online faster than ever before. Warranty valid for five years from the original date of purchase or before writing the maximum total bytes written (TBW) as published in the product datasheet and as measured in the product’s SMART data, whichever comes first. Some of the storage capacity is used for formatting and other purposes and is not available for data storage. 1GB equals 1 billion bytes. Not all capacities available at initial launch. Typical I/O performance numbers as measured using CrystalDiskMark® with write cache enabled, a queue depth of 64 (QD = 8, Threads = 8). Fresh out-of-box (FOB) state is assumed. For performance measurement purposes, the SSD may be restored to FOB state using the secure erase command. System variations will affect measured results. Results based on PCMark® 8 Storage 2.0 benchmark testing from October 2018. Throughput and bandwidth measured using CrystalDiskMark®, v6.0.1 Test System: Gigabyte™ GA-Z170X Ultra Gaming, Intel® Core™ i5, 32GB Ballistix® DRAM, Windows® 10 Pro x64. Results will vary on different computer systems and test conditions. Typical I/O performance numbers as measured using CrystalDiskMark with write cache enabled, a queue depth of 64 (QD = 8, Threads = 8). Fresh out-of-box (FOB) state is assumed. For performance measurement purposes, the SSD may be restored to FOB state using the secure erase command. System variations will affect measured results.